Superior Industrial Supply. 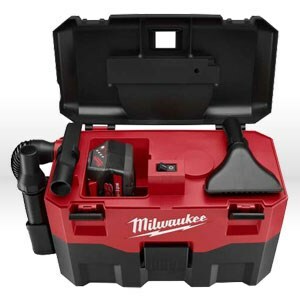 0780-20 Milwaukee Shop Vac,11-1/2" x19" x8-1/2",2 gal,Wet/dry vac,32"
With a powerful 28V motor, the 0780-20 wet/dry vacuum features 2 gallon capacity and offers longer continuous run time and higher air power and suction to provide quick and easy removal of dust, debris and water. A washable, reusable wet/dry filter delivers excellent fine dust collection.Max air flow= 45 cu. ft/min, sealed suction in water is 32".Size: 11-1/2" x19" x8-1/2", set includes: filter assembly, crevice tool, wide utility nozzle, wireless vinyl hose, please note -battery pack & charger NOT INCLUDED.